Update: This restaurant has moved location. When SheShe saw my Facebook album of the foods I ate in Japan, she was especially intrigued by the waffles over there. 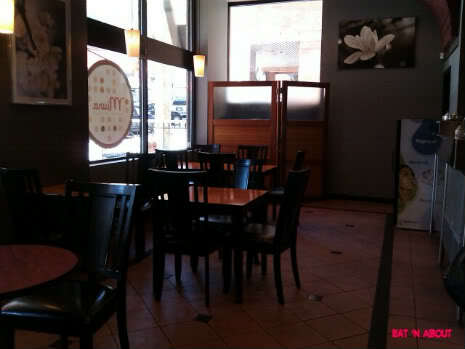 So apparently she feverishly googled for a local source of Japanese-style waffle. 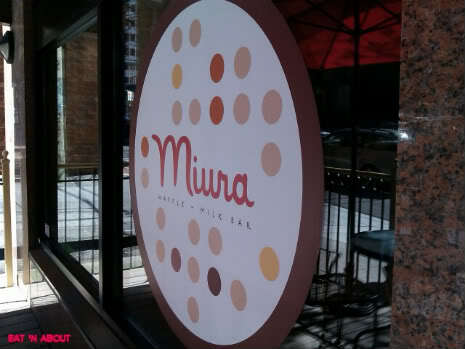 Miura Waffle Milk Bar was what she found. SheShe and I decided on sharing two waffles, one savory one sweet. The pictures are after we cut them to split so the full order is twice as big. As it was Wednesday I picked the Daily Special which was the Hoisin (regularly $6.99, special $5.99). It consisted of hoisin pork sausage, cilantro (yum! ), and pickled radish and carrot. It was interesting how they made the waffles. 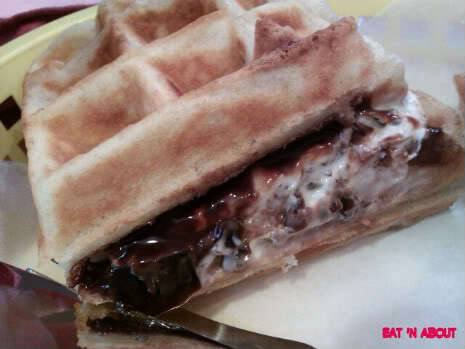 They actually sandwiched the pork sausage inside the waffle batter as the waffles are being made. This was very intriguing to me and I never would’ve thought to make an ‘infused’ waffle like that. 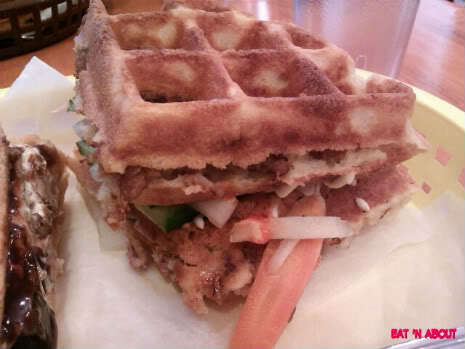 Then the waffles were sandwiched with the cilantro and pickled veggies. 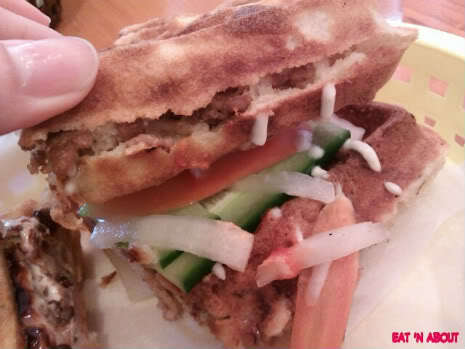 I did quite enjoy this one but the hoisin flavor was not prominent. I’m glad they did include an abundance of cilantro though. The pickled veggies were marinated very well too. Then for our sweet choice we had the Tiramisu ($5,29) which had cream cheese custard cream, coffee jelly, and chocolate sauce. It wasn’t overly sweet which suited our palates well. I wish they had put more coffee jelly into it though as that’s one of my absolute favorites. However though again the cream cheese custard cream flavor wasn’t prominent. Maybe there was an over-dousing of chocolate sauce. But in the end, not much to complain about. It was decent and hit the spot well.